A spin-off of the cult post-apocalyptic RPG series, and an online open-world survival game. You cooperate with other players or compete against them, trying to rebuild West Virginia decades after a nuclear disaster. 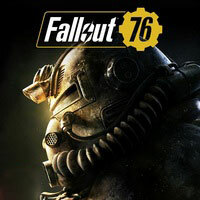 Fallout 76 is a spin-off of the popular postapocalyptic RPG series, and an online multiplayer survival game with role-playing elements. Like Fallout 3 and 4, it was developed by Bethesda Game Studios (also known for The Elder Scrolls V: Skyrim) and developing team of Bethesda Austin. Once again, you play as a dweller of a Vault—one of many fallout shelter, which saved the remains of humanity during the nuclear Great War, which began and ended in 2077. The story begins in the eponymous Vault 76, located near Washington, in the area once known as the state of West Virginia. The place doesn't differ much from other such shelters built by Vault-Tec, but its inhabitants carry out the original plan of the corporation—rebuilding the U.S. 25 years after the disaster, starting on the long-awaited Reclamation Day. The players take on the roles of pioneers, who traverse the wastelands, looking for places for humanity to settle in once again. Fallout 76 is a sandbox game, fully focused on multiplayer gameplay with constant internet connection. It meant that many of the characters you encounter are controlled by other players (although you can't see hundreds of them on screen at once). While you can walk the wastelands alone, you can sometimes stumble upon i.e. a hostile player, who wants to rob you. However, not everyone wants you dead and a random encounter can also be a start of a long-lived cooperation. The in-game world is four timer larger than the one in Fallout 4. It was divided into six varied regions, featuring distinct styles and quest types. The wastelands can also change in a dynamic way—there are many underground nuclear weapon silos hidden in West Virginia, and when you get your hands on launching codes, you can send a nuke to any place on the map of your choice to change it drastically and find rare resources. The resources can be used in outpost building. The C.A.M.P. Tool resembles the system of creating and developing outposts from Fallout 4. However, it's not restricted only to certain spots on the map, as you can take your “toolbox” anywhere and build whatever you want. But a good outpost can lure monsters, bandits and other undesirable guests. Like in the previous Fallout games, you can create your character and develop them using the S.P.E.C.I.A.L. system. However, due to the online aspect of the game, Fallout 76 does not feature the tactical targeting system known as V.A.T.S. Fallout 76 utilizes the upgraded version of the Fallout 4 engine. The upgrades include e.g. the dynamic weather system and new rendering, lighting, and terrain modules. According to the developers, the visuals are sixteen times more detailed than in the previous games of the franchise. Initially, Fallout 76 was supposed to be a DLC for Fallout 4. However, it became so expansive that the developing team decided to turn it into a standalone game. The Fallout 76 Game Guide is a complete walkthrough with many starting tips. We described all side and main tasks, character development (SPECIAL and Perks), multiplayer mode and weapons. A full map and advice on how to set a base should be very useful.